...And Sky-Rocket Your Sales Through The Roof! Who Else Wants to Wow Every Visitor With Stunning, Top-Notch Multi-Media Streaming Video Presentations And Convert Each Of Them Into Buying Customers? How about offering click-by-click multi-media presentations of your desktop activity as you demonstrate and explain exactly how your product works? I started using "flash" demonstrations on my web sites a few years ago. The first time I implemented them, I ordered "demonstration manuals" that actually didn't even have any audio, just demonstrations. Each "set" of videos would sometimes take weeks to develop and deliver. And yes, I had to cough up hundreds of dollars for each set. Nevertheless, when we put these on our customer support page, our support tickets drammatically reduced by as much as 50. These only /covered a few subjects on our web site; so over several months I ordered an almost "complete set" of every support issue I could think of. Don't forget, we still use these videos, although we are now slowly moving to the "new generation" full motion videos with audio, such as the ones made by Instant Video Suite. This gave us the opportunity to concentrate more on marketing and getting more sales; after all, there were hardly any support requests any more. Instant Video Suite videos even go a step further; you can record yourself via web cam as you explain and demonstrate click-by-click exactly how something works right on your desktop. Then produce an embedded web page ready to publish on your web site in one step. Just imagine the effect this will have on your current business or even a new venture whether in boosting sales, or for support purposes. The best part is, you no longer have to part with thousands of dollars to get these presentations done for you. Even if you previously chose to do it yourself, you still had to buy separate EXPENSIVE software products to put recorded streaming video and screen captured desktop activity into your web site. In fact you had to spend over $500 to do all this. And even then, none of these products came anywhere close to what Instant Video Suite does for you at just a fraction of the cost. And you still had to have some technical expertise, and go though a couple of steps before you could produce the final videos. Whether you sell products or services, even if you do it offline, a "live" touch will certainly close more sales for you. Suppose you could bring in 10 times more sales than you currently get on your web site? Suppose you never had to worry about supporting your customers because they just never find any support issues? Suppose every customer you had came back to buy your other products or services every time you release them because you have won their faith? 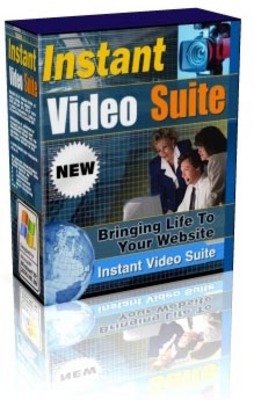 Instant Video Suite can transform your online business into a money-making monster and allow you to dominate your niche without mercy even if you're just getting started. You do not need any multimedia, web design or programming experience to accomplish this and a lot more. In short, you can transform your website into a cash magnet easily through making just small changes with no trouble at all in very little time. These are the same tactics the pros use to cream their competion and permanently stay on the top of the game. So how does Instant Video Suite work? As the name suggests, Instant Video Suite is actually a suite of very closely integrated software that offers you a seamless way of creating video presentations without even realizing that you've used more than one piece of software for your project. This way, do not need to master any specific knowledge to use Instant Video Suite. IVS ScreenCam captures and records your desktop/screen activity demonstration. It then creates a flash file (.swf) already embedded in HTML ready to put on the web (unless you choose to create a .avi file first). An .avi file is the version commonly produced by computers, but this is not ready for the internet. IVS VideoCam records activity via a web cam. For instance, you can record yourself as you create your demo on IVS ScreenCam to make your demo more effective. You can also record yourself on a video presentation that you can then put on the web. IVS Flash Creator creates flash-embedded HTML files (.swf embedded into HTML) from .avi files ready to put on the internet. You can use it to convert .avi files created from IVS ScreenCam or IVS VideoCam, or any other .avi files! It comes completely integrated with IVS Player Plus - so you can play the videos seamlessly as you convert them without having to open multiple applications . IVS CD Menu Creator creates autorun CD files of your video presentations ready to burn into a CD or DVD. This allows you to create a physical product of your video demonstrations for your customers if you need to. They just need to pop it into a computer CD drive and it runs automatically.